From The Getty Museum and Venice Skate Park in Los Angeles to the Kennedy Center in D.C. From the de Young Museum in San Fransisco to Jacob’s Pillow in Massachusetts. From The Met and The Whitney in NYC to the streets of Santa Fe. From Montreal to London and Berlin, #CamerasandDancers has built a community making dance more visible online. 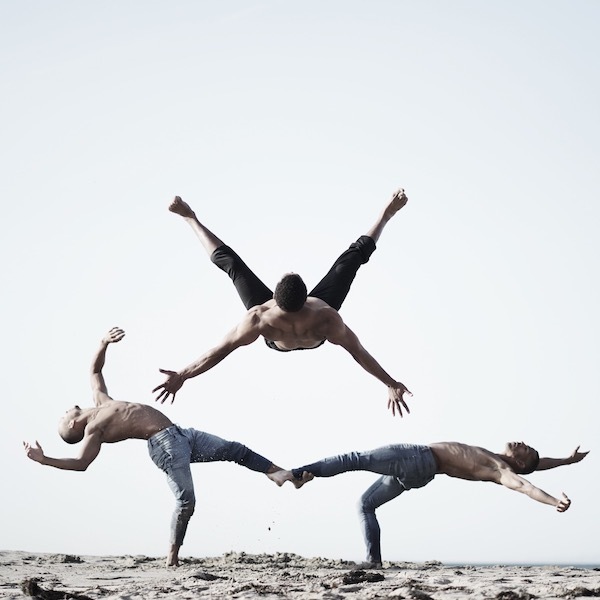 Part of the mission at Jacob Jonas The Company is to make dance a more visible and valued art form. So as it’s #CamerasandDancers initiative celebrates a milestone of 50 meets, the company expresses gratitude to all those who’ve helped make meets possible. “We thank all the dancers, dance companies, photographers, architectural firms and cultural institutions for making this project come to life and sharing in the power of collaboration with millions of people from around the world,” Jonas writes. To follow along and to see some of the company’s favorite images from the past 50 meets head to @camerasanddancers on Instagram. Photo: Mike Tyus, Nic Walton and Anthony Bryant of Jacob Jonas The Company at the Santa Monica Pier. Photo by Jacob Jonas.